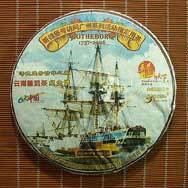 The full name of this tea is actually Ge De Bao Hao Fang Wen Guang Zhou Li Xie Sheng Bing Cha, which means "Commemoration of Gotheborg’s visit to Guang Zhou; Raw Pu’er Tea Cake". 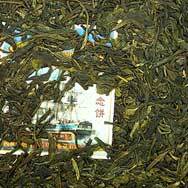 The tea leaves are harvested from Yi Bang Zheng Shan, one of the six famous tea mountains in Yunnan province. 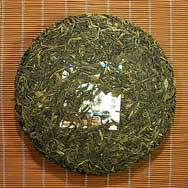 We highly recommended to collectors not only for its beautiful wrapper painting, but also because the production of this tea cake is limited to 30,000 pieces only. Looks and smells good, haven´t tasted yet. Out of the 8 teak cakes I just received. This is the one will turn out to be the best after aging. Like the pricier Jiu Wan AWT and the XG Wild, manages to be mild while cramming the palate with great flavours - all at an early age. For the money, this is hard to beat. Then there’s that wrapper...and those pretty leaves. A real winner.